SKU: Dolphin Royal Swim Plus Riviera Maya. 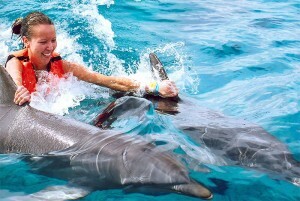 Categories: Swim with Dolphins in Cancun. Action and speed, are two words that perfectly depict The Dolphin Royal Swim program in Riviera Maya, Puerto Aventuras. 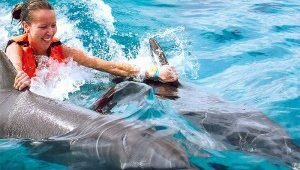 It is the most dynamic Dolphin Swim program, making it one of the most talked-about experiences in the Riviera Maya. 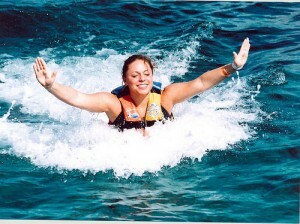 Our docile dolphins offer an array of aquatic activities for you, your family and your friends. The dolphins will win your heart before you even get into the water. Watch how the dolphins will follow you, waiting anxiously to play, as you walk by the pier. 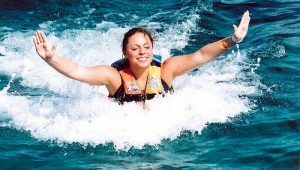 Once you’re in the water, the Royal Swim includes the famous foot push, where your dolphin friends will push you from the soles of your feet up to the water surface. After that, you will grab their dorsal fins as they speed through the water, giving you an exhilarating ride. 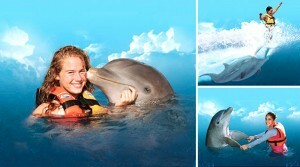 Our well trained dolphins will also willingly give you a kiss, a hug and enjoy some playtime with you. After your Dolphin Royal Swim program, you will be able to relax, unwind and enjoy our facilities in Puerto Aventuras. Our dolphinarium is located in the pristine environment of a gated community in Puerto Aventuras, Riviera Maya, just a few minutes from Playa del Carmen. Behaviors: Foot Push, Hug, Hand target, Dorsal Tow, Kiss, Handshake, Interaction with sea lions and manatees. 6 to 12 year olds must participate with a paid adult as companion.